Do you have a piece of furniture that you really like, but the fabric has worn thread bare? Well I have! I know that other people have reupholstered their furniture. I thought if they could do it, I would give it a try. The first couch I reupholstered was a couch that had a bed that you pulled out. This couch was left in the house we bought. I wanted to use it but it didn't match other furniture pieces I had in the room. I decided I would try my skills and reupholstering it. Just let me say, the first couch you reupholster probably should not be a couch with a bed in it. I am very happy to say that my daughter and I took the bed out and began the process of taking the material off one piece at a time. I have learned to write down each piece I take off and the order I took it off. The pieces you are taking off is your pattern to use to cut the material to go back on the couch. I don't know how professionals do it, but here is what I did and what I have learned in the process of recovering 5 couches. What ever you take off first will probably go back on last. I will use the last couch I reupholster as my example since it is the freshest in my mind. The material I am using is just slightly different in design and just a shade different in color but I really like burgundy and it matches my decor. As you can see the sun had faded the back of the couch, as it sat in front of a picture window. The arms of the couch were dry rotten and were beginning to show their wear. I had patched the couch using material from the ruffle that was on the back of the couch in several places. 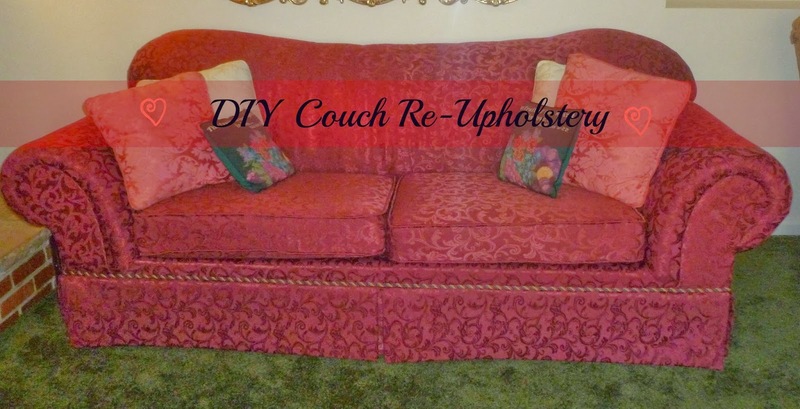 To start your project of re-upholstering your couch. Remove the material that is on the back of the couch. 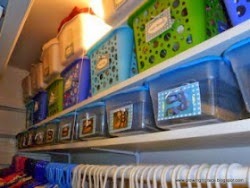 You will need a pair of pliers to remove all the staples and nails. This will be expose how the front of the couch and the arms are attached. Remove the material from only one arm at a time, so you will have the other arm to show you how to put the material back on the couch. This picture isn't very clear, but it is the material that is on the bottom of the arm side view. Remove it only on one side of the couch. Now you will have the arm itself exposed to show you the nails or staples that are holding it on. Remove the staples and nails and use the material you take off as your pattern to cut the new material pieces. Then put the new back on as you took it off. Move to the next section. Do the same there as well. I used the backing of the ruffle that goes around the bottom of the couch with the new material and sewed them together as the new ruffle. Staple the under backing back on the couch before you staple the ruffle back on. By using the lining with the new fabric and sewing it wrong side out and the matching up the un-sown edges it will pull the material up to form the hem. The edge that is folded back will be the center of the front of the couch. You will put one of the small panels behind it. Turn ruffle right side out and steam press your ruffle before putting it back on. The small pieces are for each corner and the front middle. Staple the cording on before you put the ruffle on. Next put the ruffle right side toward the couch and staple it to the cording bottom that will not show when the ruffle is put back down. This is the way the front ruffle will look when finished. The arm panel is covered separately and then hammer back on to finish off the arms of couch. Put the back material on. Throw pillow add some more color to the couch. Looks brand new. I really like it. Just saying, if I can do it so can you. Great job your sofa looks wonderful! Good job, and I know how much work that is. I've reupholstered so many times, but I think I'm done. You are so brave! I have a chair I need to reupholster and haven't quite gotten up the nerve. I appreciate the tutorial. It will help me with my chair. I am visiting from Coastal Home and am a new follower. I hope you have time to visit me at Still Woods Farmhouse. I am sharing a terrific Superbowl appetizer! You did a great job. I did one last year, and I don't know that I would ever do it again. It was so much work. I'm so impressed that you have done 5 couches. Looks great! Have you ever reupholstered a couch with built-in recliners? I have one that I am thinking of trying and would love some input. No, I have not reupholstered a couch with built-in recliners. I did a couch that had the bed in it. I took good notes as I took it a part, so I would know how to put it back together. It was quite a job. Good luck if you try it.